The apartment is around 120 sq metre. We take great care to provide this apartment with equipment imported directly from UK, lock "Yale" , bedding, sheets, throws, curtains, towels , scatter cushions, showers ... The furniture is made by a famous Mauritian cabinetmaker . An apartment with all the comforts to European standards - all 3 bedrooms are air-conditioned, two electric fans are also supplied , with safes in the 2 main bedrooms.We have internal security that is linked directly to Securicor on a 24 hour basis. Also equipped with smoke alarms, gas detector, fire blanket and fire extinguisher. The apartment has a large frontal terrace, overlooking the tropical garden and pool and a back balcony overlooking the river. The tropical garden is maintained by the syndicate.It also has tennis courts and parking. Security is provided 24 /24. 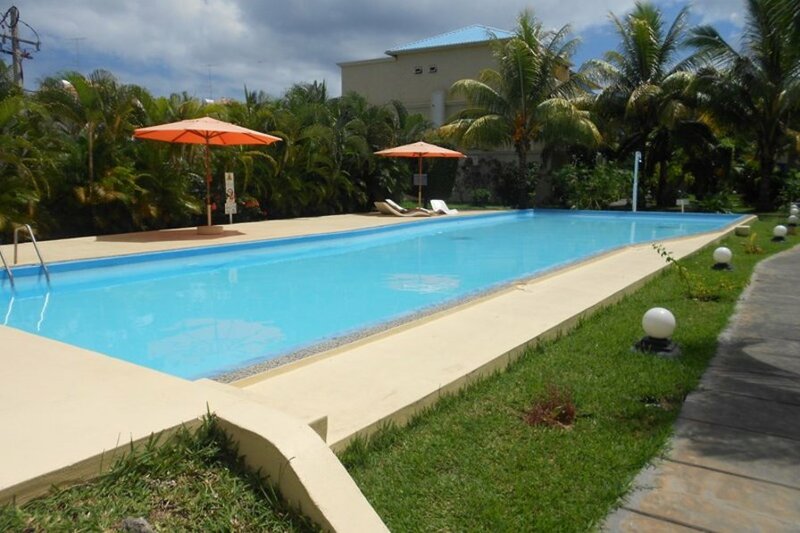 The apartment is located five minutes from the beach in Flic -en- Flac, a beautiful sandy beach , stretches for miles. One can find a generally warmer corner on the west side of the island sheltered from the wind due to the presence of a chain of mountains, the Black River. Flic -en- Flac, you will find: bakery, polyclinics , supermarket, etc. .. You are assured of a varied gastronomy , very affordable because of this mixture of cultures - Flic-en-flac has restaurants to cater for different tastes, Chinese , Italian, Indian , Europeans. we hope you will feel at home , the famous ' Home Sweet Home `. We have our representative in Mauritius who is always happy and ready to help . A local telephone , free of charge, is put at the disposal of the client , for local calls or to get in touch with the representative. We can offer car rental at a discount rate for our clients.The cleaner calls every third day , by default. Other arrangements may be made for a small fee. Note : We are part of a complex that provides tennis and Gym . We do not supply tennis racquets.